There are few things more satisfying and delicious than a salad made fresh from your own garden. However splendid, this summer, step outside the usual greens, tomatoes and cucumbers, and add new flavors and textures to shake up the standard recipe. Really, any vegetable harvest can go into a salad: onions, squash, carrots, radishes, beans, kale, chard, and beets. 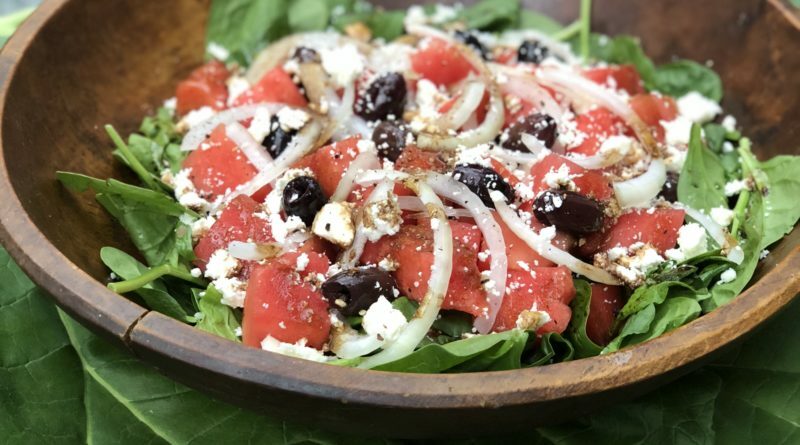 Tonight we’re making a chunk watermelon salad with sliced Vidalia onions, Kalamata olives, Feta cheese, black pepper and a Balsamic vinaigrette lying on a bed of spinach. Something sweet became savory. Watermelon with mint, lime and a drizzle of local honey is a phenomenal dessert salad. Other things to toss into a salad: crunchy Chinese-style noodles, toasted or sugar-glazed nuts, any kind of seed, herb, or edible flower, and summer fruits and cheeses. Once the salad’s made, it’s time to dress it up. Match the dressing to the tastes in the salad and the rest of the meal. Basil in the salad served with pesto pasta. Try a savory dressing on a sweet salad, or a sweet dressing on something more base or salty– served with a protein or by itself with a crusty loaf of bread. The jar. A small, lidded Mason jar will do, or a pretty bottle with a strong stopper. Add all ingredients to a jar, cover tightly and shake until emulsified; enjoy with fresh greens and chunks of apple.